Pickled, roasted, in a sandwich – radishes have much more to offer than you might think. Grab a bunch and make one of these fresh, crunchy dishes today. They're pretty, (often) pink and always there to add a delicious crunch to whatever you're eating. But what if you're bored of the same old preparation of the humble radish? Here are some tasty ideas for serving up these beautiful springtime treats. Radishes are really well-suited to pickling – a sweet and sour pickling liquor really complements their peppery taste. As you want to retain the lovely crunch, they only need pickling for 30 minutes to an hour. Slice them into little discs or pickle them whole as Paul Foster does in his pickled radish recipe with dill emulsion. In this era of ‘nose to tail’ cooking, consider eating the radish tops as well. The grassy, bitter leaves are great in a salad, whipped up into a pesto or blended through a green soup for a peppery finish. James Ramsden makes the most of every part of the radish in his recipe, pairing beautiful roasted radishes with their leaves, whipped feta and brown butter leeks. Although cucumber sandwiches may hold the crown of being the most iconic British summertime sandwich, radishes shouldn't be ignored for adding a cool crunch to your favourite snack. Helen Graves serves finely sliced radish with an anchovy butter for a refreshing, punchy lunch that packs visual appeal. Peppery radishes work brilliantly in coleslaw, particularly the long, white daikon, thanks to its size and crisp mellow flavour. Pair with sharp apple, sweet beets or earthy celeriac for a wonderfully refreshing side dish. It's easy to forget how good roasted radishes are, simply tossed in olive oil, scattered in sea salt then roasted in a hot oven. Drizzle with honey five minutes before taking out of the oven for a delicious twist. Sweet and juicy but still with bite, roasted radishes are great in salads, for topping risotto or served up as a side with a dollop of radish top pesto and some Greek yoghurt. 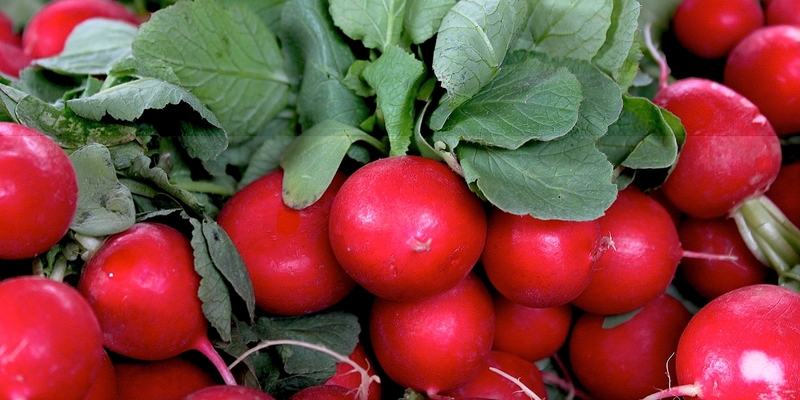 For even more inspiration, check out our collection of radish recipes.